M-200 (1,1,1,2,3,3,3 - heptafluoropropane) is a compound of carbon, fluorine and hydrogen (CF3CHFCF3). It is colorless, odorless and electrically non-conductive. It suppresses fire by a combination of chemical and physical mechanisms without affecting the available oxygen. This allows personnel to see and breathe, permitting them to leave the fire area safely. In the very unlikely instance where a discharge occurs in an occupied space, personnel will be able to see and breathe, permitting them to leave the area safely. As such, the system is authorized for use in normally occupied spaces. FM-200 has acceptable toxicity for use in occupied spaces when agent concentration is in accordance with NFPA 2001, and the applicable rules of the International Maritime Organization (IMO) and US Coast Guard. 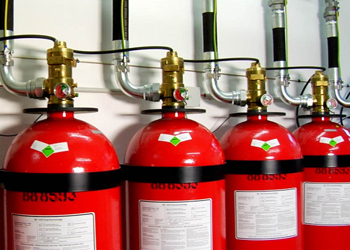 The FM-200 zero Ozone Depleting Potential (ODP) fire suppressant supplied and installed by GIELLE is now well established as the single most effective Halon 1301 replacement. It is approved and verified around the world by such organisations as Britain’s Loss Prevention Council, Lloyds Register, and the US Environmental Protection Agency. 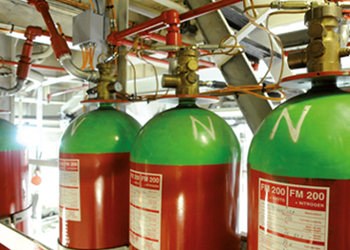 FM-200 is suitable for virtually all total-flooding fire suppression applications, although it is most commonly used to protect vital company assets – those upon which the company’s survival might well depend. However, as it does not remove significant quantities of oxygen or obstruct vision, FM-200 is also ideal for use in occupied rooms or enclosed compartments, and is quickly cleared when ventilated. Fires are extinguished rapidly, typically knocking out class A, B and C fires in less than 10 seconds. This minimises atmospheric toxicity and the generation of smoke and soot. 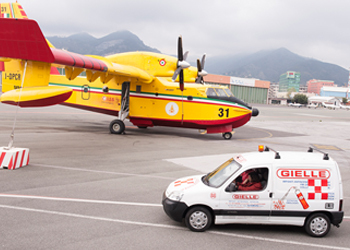 Physical and chemical actions combine in FM-200 to form an irresistible fire fighting force. FM-200’s physical properties lower the flame temperature, while the chemical action suppresses flame propagation. In fact, FM-200 is the appropriate choice in applications where liquid extinguishants, water-based or dry chemical products can cause costly damage or result in considerable and expensive downtime. Because of its zero conductivity, this includes electrical, communications and data processing equipment and plant or machinery. FM-200 also scores where cylinder storage space is at a premium. For normal Class A fire risks, only 7% by volume FM-200 is needed for extinguishing purposes, resulting in far less space being taken up than with many other gaseous extinguishing systems on the market. Its short atmospheric life has made FM-200 an acceptable option with many environmentalists. Atmospheric life is believed to have a direct link with global warming, and FM-200 withstands favourable comparison with the other Halon 1301 alternatives on the market, some of which have extended atmospheric lives. The Gielle Marine System is the most optioned system as a Halon replacement system. Often, the system can be dropped into existing pipework reducing retrofit time and costs. Halon 1301 Drop-In: The combination of the aforementioned features allows the system to be used as a virtual “drop-in” replacement for existing halon installations. Most changes are limited to agent storage cylinder and nozzle replacement. Life Safety. The FM-200 clean agent works by interrupting the fire on a molecular level, not by taking oxygen from the protected space. So it is the preferred fire suppression agent for protection of shipboard spaces where crew or other occupants may be present.